Cheong, P.H. (2018). ASU professors weigh in on Facebook's latest privacy scandal. Interviewed by Jessica Myers, April 26, 2018 for The State Press. Cheong, P.H. (2017). More churches are going hi-tech to connect with the smartphone generation. Interviewed by Lauren Reimer, July 7, 2017 for CBS 5/ 3TV broadcast & online programs. Cheong, P.H. (2017). Loss of authority? Formation of spiritual authority. Article published in IMPACT magazine, 41(1), 18-22. Schober, J. & Cheong, P.H. (2016). Bridging the Asian digital media knowledge gap. ASU Now news. Interviewed by Emma Greguska, November 22, 2016. National Public Radio, KJZZ 91.5, Phoenix, Arizona, August 15, 2016. ASU Professor: Let's end the classroom war on mobile devices. The Huffington Post, July 1, 2016. End the classroom war on mobile devices. Op-ed by Robert Shuter. ASU Now news, July 29, 2016. Smart use of smartphones in class. Students, professors have different views on mobile use. ASU Research helps bridge the gap. Cheong, P.H. (2016). Scripture as spam: What 5 experts think about Twitter Bible bots. Interviewed by Morgan Lee, Christianity Today, May 20, 2016. Maxwell, Huffington Post, for a live broadcast on the power of social media prayer. The Valley Times, for a featured story on online identities and culture. Cheong, P.H. (2014). His Holiness on Instagram. The web brings the Pope and the Dalai Lama close. But not everything works. [ Dutch: Zijne Heiligheid op Instagram. 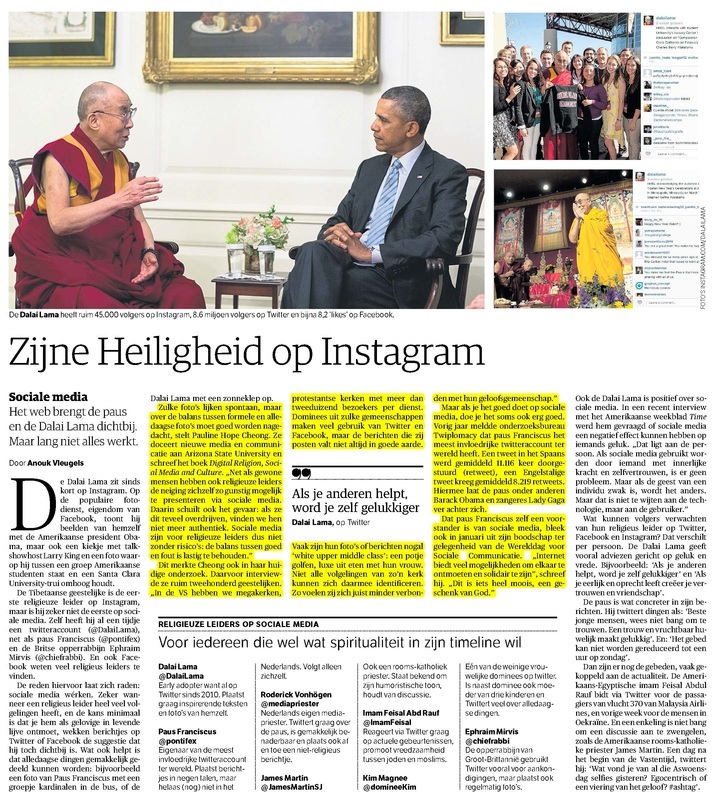 Sociale media- Het web brengt de paus en de Dalai Lama dichtbij. Maar lang niet alles werkt]. Interviewed by Anouk Vengels, for a featured story on a Dutch newspaper, NRC Handelsblad, March 19, 2014. Cheong, P.H. (2013). Religious authority, the Internet and social media- a podcast focused on my research. Interviewed by Christopher Cotter, The Religious Studies Project, in association with the British Association for the Study of Religions and with support from the University of Edinburgh. Ruston, S., Lundry, C., Cheong, P.H. & Bernardi, D. (2013). Narrative Landmines. The Explosive effects of rumors in Syria and insurgencies around the world. Small Wars Journal, Vol. 9, No. 3. Cheong, P.H. (2012). Web Vigilantism and the Human Flesh Search. Interviewed by Kate Allen, for a feature on Vigilantism, The Toronto Star. Cheong, P.H. (2012). How new media is changing the shape of religious practice. Interviewed by Masako Fukui, Australian Broadcasting Corporation’s national radio network, Radio National. On Encounter, a weekly hour long award-winning program that explores the intersection between society and religion. February 11, 2012. Cheong, P.H. (2011). How religious organizations are using social media. Interviewed by Alan Webber, Altimeter Group, a research and advisory firm for a research report. Cheong, P.H. (2011). Religion and Social Media: Understanding Critical Connections and Disconnections. Media Development. Cheong, P.H. (2010). 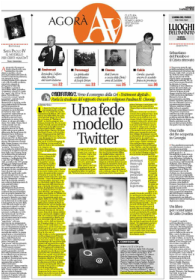 Religious Microblogging (Unafede modello Twitter) Interviewed by Andrea Galli, journalist for the Italian catholic daily Avvenire. http:// www.avvenire.it. 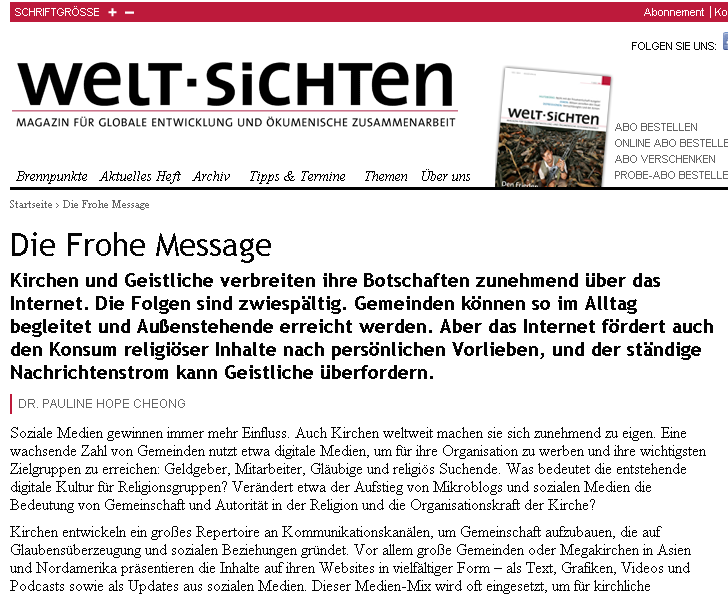 Interview appeared on the front page of the paper, and was requested for foreign opinion makers and media experts in anticipation of the convention "Digital Witnesses" April 2010, organized by National Bishops Conference. Cheong, P.H. (2009). A broader view of Internet radicalism. Comops- A Journal of Strategic Communication. Cheong, P.H. (2009). Religious Blogging. Interviewed by Justin Piehowski, MinnPost.com- A thoughtful approach to news. Cheong, P.H. (2009). Praying upon a star: Michael Jackson spectacle highlights online rituals. Religion Dispatches, 07/12/09. Cheong, P.H. (2009). Twitter of faith: Microblogging the Divine. Religion Dispatches, 03/12/09. Cheong, P.H. (2009). Christianity-Lite: In 140 characters or fewer. Religion Dispatches, 04/12/09. Cheong, P.H. (2009). E-vangelism: Thou shalt not covet thy neighbor’s blog-Ranking. Religion Dispatches, 01/16/09. Cheong, P.H. (2005). Digital spirituality? Changing access issues and faith opportunities for Internet and society, Church and Society in Asia Today, 8 (2), 38-52.